You must be a member of the Munich Cycling Group to attend this activity. Would you like to join this group? Hi fellow cyclists; we hope you’ve all had great starts to Protected content ! Our names are Ben and Monica, and we've both made new year resolutions to try and get this group together a bit more over the next year. We plan to have some fairly casual cycling meet-ups and also some more challenging activities for the lycra lovers amongst us. To start us off we would love to get to know a few of you, and to find out your own ideas and thoughts about what you would like to see in the group. 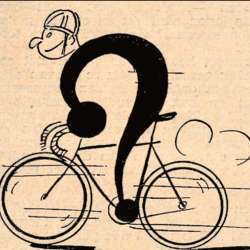 As January looks like it might be a bit frosty for a lot of people, what better way to do this than over a cycling themed pub quiz! So, come and join us at the end of the month from 19:00 to 22:00 at the Protected content to test the old grey matter on all things cycling related! We will organize into small teams of 4 at the venue, so don't worry if you are coming alone – and please don’t let the fact that we both work for InterNations put you off! We will ask for a small contribution of €2 per attendee to cover the cost of some cool prizes for the winning team! Food is available at the venue, and naturally they have a wide selection of liquid refreshments 😉 Should go without saying: everything here is at your own expense! Please do come thirsty as they will be expecting us to order drinks at the very least. Got a question? Then please write it on the wall or send one of us a PM! If you are going to be late please let us know on the wall of the activity, but of course try and be on time.